All the Bucking Bronco Baby Room Decoration Ideas, Decor and Bedding You Need to Create the Perfect Cowpoke's Quarters for Your Little One! 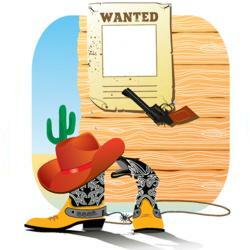 Bring the excitement of the Wild West into your baby's nursery with the nursery ideas we've got for you on this page. Don't forget there are wonderful nursery decor options available for your little cowgirl too - a western nursery doesn't have to be just for boys! A western or cowboy nursery theme will last right through the toddler years and beyond and it is really easy to create. From Buffalo Bill's vintage Wild West to a more modern rodeo ride there are lots of ways to wrangle your western cowgirl or cowboy nursery theme. You'll also find a cowboy's ranch of inspiration in the wide range of western baby room decor available on the market. From bucking bronco rugs to horseshoe drawer pulls, you'll find everything you need to decorate your little cowpoke's quarters at our Cowboy Nursery Theme Decor Store. Or mosey on over to the Wild West theme section at ababy.com. You'll find a bunch of "Ye-haw!" mix and match western theme decor all in one place. Furniture, bedding, lighting, rugs and more. It's your one stop Wild West theme shop! Click here to go to the ababy.com Wild West baby room decoration section. 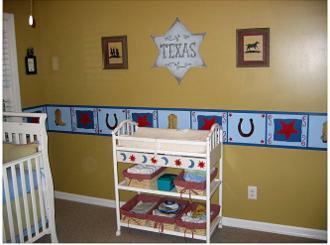 If you are decorating a cowboy or cowgirl theme nursery enter it in our baby nursery photos contest here. You could win a great prize and we will add your nursery to this page to inspire other moms! Mainly whites and off whites mixed with earthy tones and splashes of red for a vintage theme. Rich browns and reds mixed with sandy colors for a cowboy's nursery. Pink, brown and black for your little cowgirl. Red, white and blue for something more dramatic. Cow print fabrics or stencils. Sheriff's gold badge and star printed fabrics. If you decide on a vintage western theme, vintage cowboy posters in aged wooden frames make stunning nursery wall art. You can find beautiful iron cribs with horse and pony finials to go with it. If you want to go for a cartoon type wild west theme, you could base your nursery design around Woody from Toy Story, or Walt Disney's Goofy. What about a cowboy/cowgirl theme with Mickey and Minnie Mouse as the stars? A desert scene with cacti. A horse in the barn. A cowboy on his wagon. A cowgirl wrangling the cows. If you want to keep it simple just paint a few hats, boots and stars around the room. How about creating your baby's name on the wall using rope? Or paint a large cowboy hat on the wall and paint your baby's name on the hat band. Another idea is to paint a big lasso and paint the letters of your baby's name going around the curve. Or simply use big aged wooden letters to spell your baby's name across the wall. You can give the room an authentic western feel by incorporating some real leather goodies picked up from your local horse barn. Why not replace your nursery door with a top and bottom stable type door? See if you can find a nice saddle bag - hang it on the wall and use it for storage. Create a teddy bear cowboy nursery by dressing some teddies as cowboys with hats and bandanas and sitting them on toy horses. Continue the teddy bear theme on the walls. 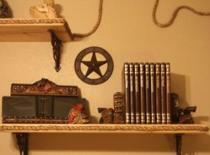 Add a few children's storybooks with a western theme to your baby's bookshelf. You can talk to him about the Wild West when you read to him at bedtime. Cozy it up with a few soft toy horses or cows. And last but not least, don't forget to include an old fashioned rocking horse!